So you think you can spell? 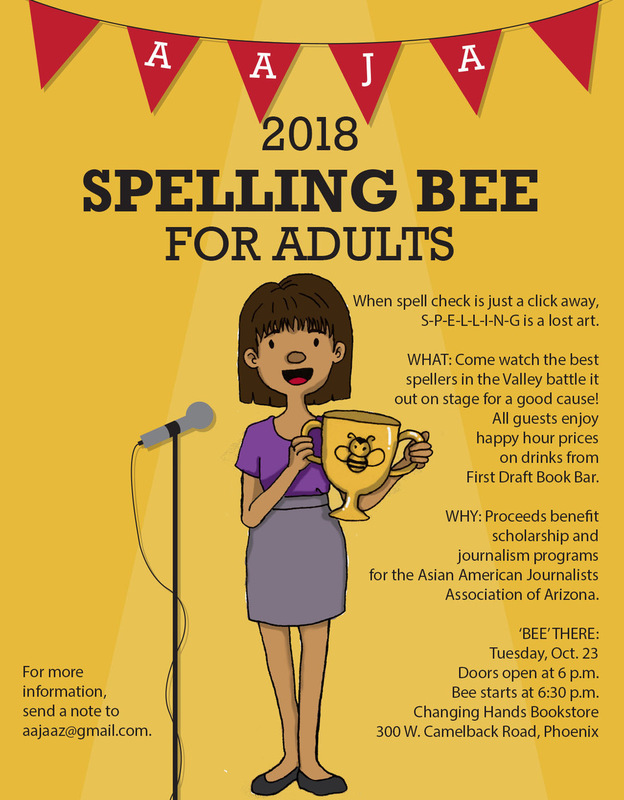 AAJA-Arizona invites you to compete for the honor of supreme speller in the 2018 Spelling Bee for Adults, 6:30 p.m. Tuesday, Oct. 23, at Changing Hands Bookstore, 300 W. Camelback Road, Phoenix. Doors open at 6 p.m. Entry for spellers is $10. Shoot an email to aajaaz@gmail.com to sign up. Non-competitors are welcome to come and watch all the letter-reciting action. Happy hour-priced drinks will be available at the store’s First Draft Book Bar. AAJA is also selling raffle tickets ($5 a pop) for prizes including gift cards to Fox Restaurant Concepts, Snoh Ice Shavery, Genuine Concepts, Great Wall Cuisine, and the grand prize: a one-night stay at the Hotel Valley Ho in Scottsdale. Admission is a suggested donation of $10. Proceeds benefit scholarships for the Asian American Journalists Association of Arizona. Details, RSVP here. This entry was posted in Journalism Events, Networking and tagged AAJA, adults, bookstore, changing hands, happy hour, spelling bee by Valley of the Sun SPJ. Bookmark the permalink.